Between a tree-covered ridge and the Atlantic Ocean lies the resort village of Ogunquit, long a Mecca for artists, beach-goers, and generations of summer visitors seeking the relaxation of the sea shore. The artists drawn to this scenic sea side village early in the 20th century attracted a cosmopolitan audience appreciative of fine art, fine food, and creative theater. 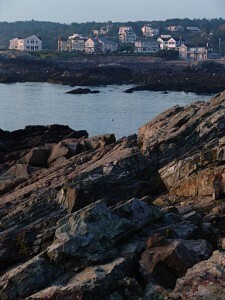 Today visitors come from literally all over the world to experience the special joys of Ogunquit: friendly guest houses, offering genuine hospitality, numerous restaurants offering a wide range of menus, quaint shops offering everything from antiques, artworks, and resort wear to gourmet sandwiches and homemade candies, pastries, and ice cream. After your first visit to our three mile sandy beach and a walk along the Marginal Way foot path which winds from the village, along the rocky sea shore, to picturesque Perkins Cove, you will agree that the Abenaki Indians aptly named this place: Ogunquit – Beautiful Place By The Sea. For Shoppers, Kittery , Maine with its dozens of factory outlets is only 10 miles south of Ogunquit. About an hour north is Freeport, home of L.L.Bean and many other outlet stores.